I’m still rolling along with some of the healthy recipes, don’t abandon me there’s chocolate coming soon! But if you made one of those resolution things for nought-16, stick this tasty kale salad on your lunch rotation. The quantities are very loosey goosey so don’t be shy to taste and tweak the recipe as you’re making it. Any grain could be switched for the quinoa, spinach for kale or green onions for red onions. But let’s stick to what’s on the screen. 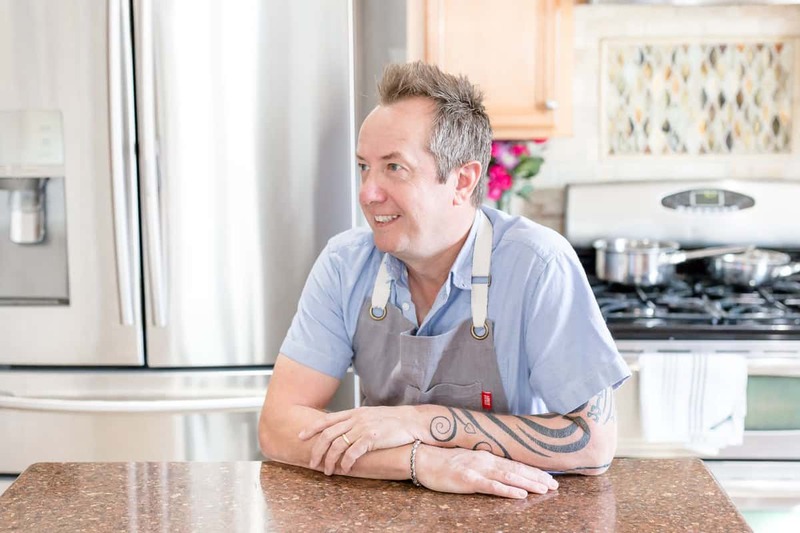 I’ve noticed that salmon and chicken are always popular ingredients for people to cook with. Both are easy and full of protein, and you can roast them in advance so that all you have to do is chop them up and add them to a salad at the last minute. Kale. I like you but you’re not the first green vegetable I think about when I’m in the produce section, but I’m changing and I think a few more dates are needed before I really fall in love with you. Until then, I’ll keep sneaking you into other things like salads and wraps. There’s a few steps to this salad but you can start a day ahead and then all you need to do on the day is put it together. 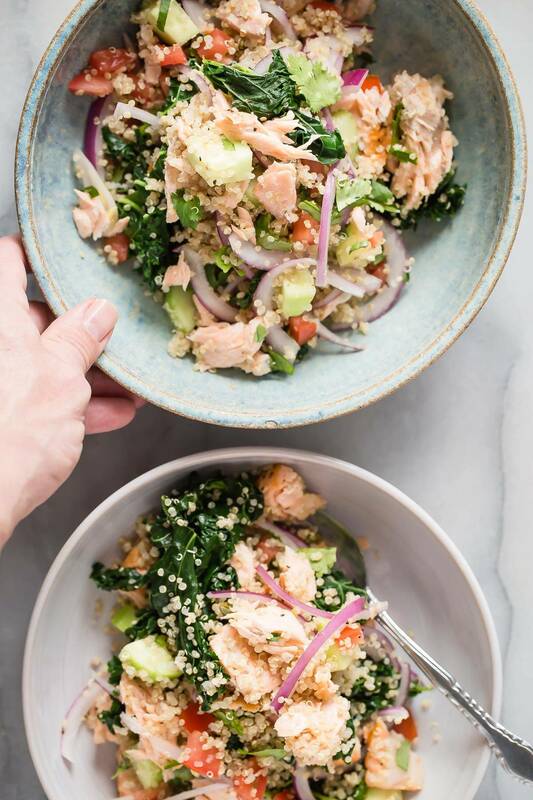 Don’t worry too much about cooking the salmon perfectly because it’s going to be crumbled up and mixed in amongst the rest of the ingredients. This ain’t no salmon cooking skill test. The dressing is a simple lemon juice, mustard and vinegar mixture with some (a good tablespoon) of minced garlic. Mix that with some awesome extra virgin olive oil and add it to the salad in small quantities. I don’t think you’ll use it all, but it’ll keep and can be used on something else. Salad dressings are so simple to make and they’ll free up some space in your fridge doors from store bought bottles. If you have any of this salad leftover you were probably at the wrong party, but throw it in a container and it’ll be perfect for a quick lunch the next day. Let me know if you make this or any of my recipes by leaving a comment or tagging me on Instagram (@foodnessgracious) it makes me happy to see your creations. 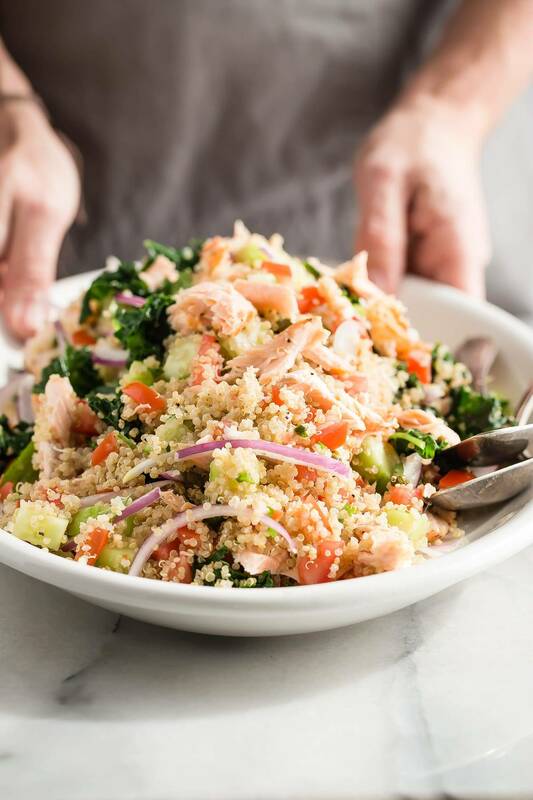 A fresh and protein-packed super salad full of quinoa, roasted salmon and fresh steamed kale. Toss with a garlic and lemon dressing and garnished with capers. 1 bunch of green kale washed and roughly chopped without the stems. Season the salmon with salt and black pepper, or your favorite seasoning mix. Place the salmon in an oven-safe pan and bake for about 20 minutes or until no longer pink in the middle. Let cool. In another pan bring the water to a simmer and add the kale. Cover and steam until wilted and soft, about 5-6 minutes. Transfer the kale to a plate and giving it a slight squeeze to remove any excess water. Make the dressing by adding the lemon juice, white wine vinegar, garlic, and Dijon to a blender. Slowly pour in the extra virgin olive oil and mix until it emulsifies and thickens. Peel the cucumber and cut it in half lengthwise, chop each half and add to a large bowl. Cut the tomatoes into quarters and take out the seeds. Slice, chop and add to the bowl. 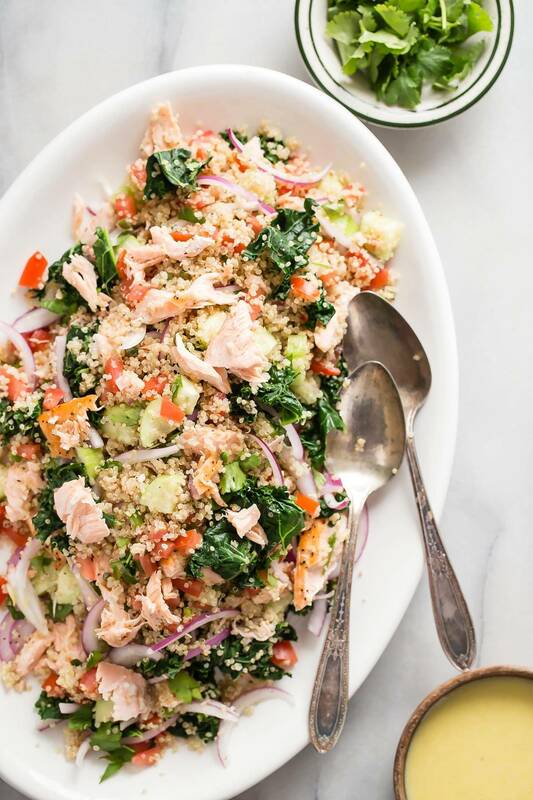 Slice the red onion thinly and add to the bowl with the jalapeno cilantro, capers, cooked quinoa and chopped kale. 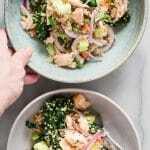 Break up the salmon into chunks and add half to the bowl. Add some of the salad dressing and toss all of the ingredients in the bowl together. Taste and add more dressing if you prefer. 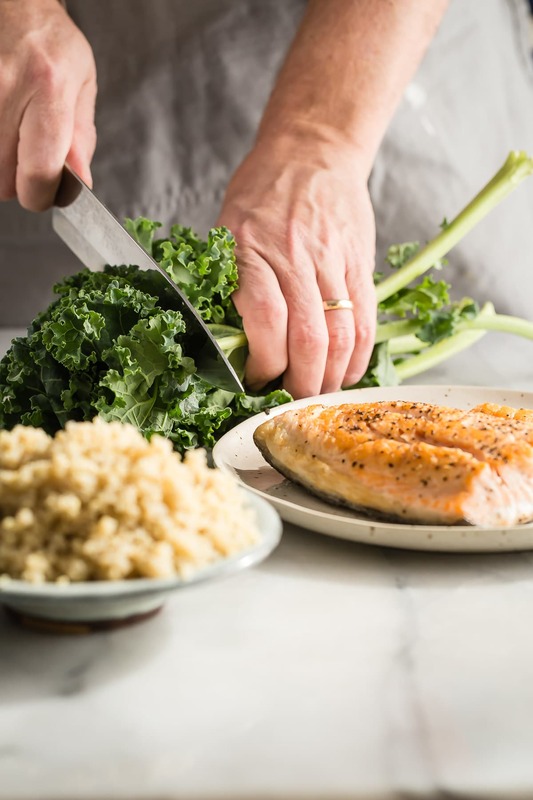 Transfer the salad to a large serving platter and crumble the remaining half of the salmon over the top. Serve at once with extra dressing on the side. 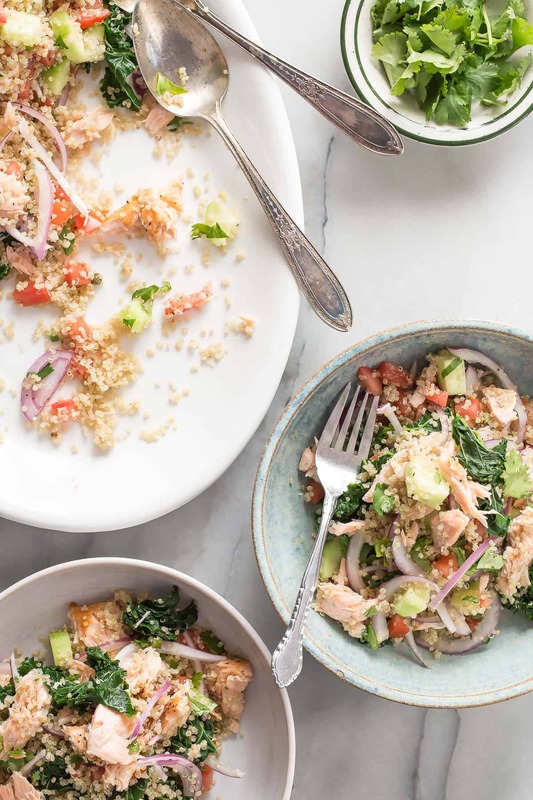 Always looking for healthy recipes, and your salmon and quinoa salad looks like a winner. Will have to try this recipe. I am always on the look out for new and interesting ways to eat salmon and get those omega 3s in. After a weekend of gluttony, I need a big bowl of this salad! I love hearty salads like this–great for dinner or lunch! What a wonderfully balanced, beautiful and healthy salad! I need this salad for lunch to offset the chocolate I added to my granola ;). This looks so hearty AND healthy!! You can bet I am making it! This looks wonderful, but I’m not a fan of quinoa. Can I sub couscous or rice? I’ve made this many times!! It’s always delicious and a favorite of my family’s! I’ve even made it with chicken or shrimp before.